French striker Anthony Modeste is demanding 11.6 million US dollars from the Chinese Football Association Super League's (CSL) Tianjin Quanjian and is currently not with the team, Tencent Sports reported on Thursday. Modeste is asking Quanjian to pay 11.6 million dollars or he said he would take the case to the International Federation of Association Football (FIFA). Meanwhile, French sports newspaper L'Équipe said that Modeste and Quanjian already cancelled their contract and the French player would join Lokomotiv Moscow. According to Modeste’s agent, Patrick Mendy, they have not heard from Lokomotiv Moscow, but his client is willing to leave CSL and may be interested in offers from the Russian team. 30-year-old Modeste started his senior career at French club Nice in 2007. He left France in 2013 for Bundesliga’s TSG 1899 Hoffenheim and began making outstanding performances after he moved to Köln in 2015, scoring 40 goals in 68 games. 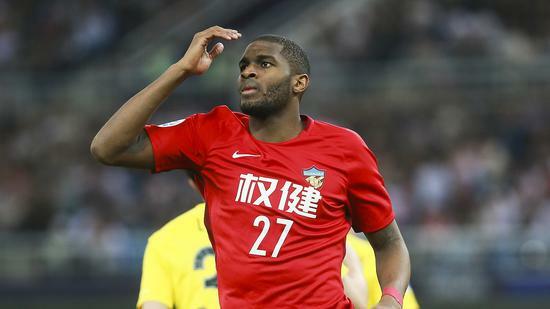 In summer 2017, Modeste joined CSL’s Tianjin Quanjian on loan from the German club. Quanjian already lost Axel Witsel to the Bundesliga’s Borussia Dortmund due to having a release clause of only 20 million euros. They are now in a similar situation with Modeste. This summer has been a cold one for the CSL club.